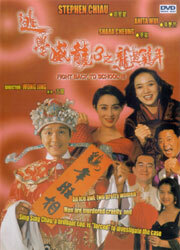 Win's Movie Production & I/E Co. Ltd.
Fight Back to School 3 (逃學威龍3之龍過雞年) is a Hong Kong comedy film produced in 1993 starring Stephen Chow, Anita Mui and Cheung Man. The film was written and directed by Wong Jing, who replaced Gordon Chan as the director of the third installment after the 1992 film, Fight Back to School II and the 1991 film, Fight Back to School. Phil Mills of FarEastFilms.com felt that Fight Back to School 3 was the poorest of the three in the series, and that "no attempt is made to connect it to its predecessors." ^ "Fight Back to School 3". FarEastFilms.com. Archived from the original on 19 May 2010. Retrieved 22 March 2007. This page was last edited on 13 April 2019, at 12:48 (UTC).